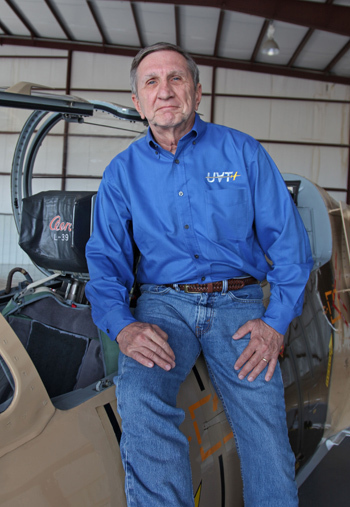 Robert J (Zak) Tomczak has joined UAT’s Team as Safety Officer consultant for its flight operations relating to the T-6 Texan and P-51 Mustang. Mr.Tomczak is the President of Peregrine Defense Solutions, LLC, an independent aviation safety consulting company that offers program management to a select list of corporations involved in unique flight operations. Zak, as he is known, grew up in the northern Wisconsin city of Park Falls, learning to fly in his father’s 1946 Aeronca Champ at age 16. He graduated from the University of Wisconsin with a degree in business administration and was commissioned as a second lieutenant in the USAF through the AFROTC program. Zak served as Chief Flight Examiner of the Air Force’s largest F-16 Wing, Flying Safety Officer, Chief of Flight Safety of the Air Force’s first F-16 combat wing and Chief of Safety of Air Combat Command at its headquarters at Langley Air Force Base Virginia where he was responsible for the Mishap Prevention Programs for the 120,000 person command flying over 1800 aircraft. He led numerous Air Force Mishap and Accident Investigations and was awarded the Air Force Chief of Staff Individual Safety Award for his flight safety program management and investigations of F-16 mishaps during the early operational use of the aircraft. After 26 years, Colonel Zak retired from active duty. He flew both the F4 Phantom and F-16 Fighting Falcon and held various leadership positions including Operations Group Commander, Director of Operations of the Alaska NORAD region and fighter wing Vice Commander. After retirement from the USAF, Mr. Tomczak joined Lockheed Martin Corporation in Orlando Florida as Director of International Business Development. He retired from Lockheed Martin Corporation in 2015. Zak has flown over 3,300 hours and holds Commercial, Instrument, Single and Multi-Engine ratings. Zak’s vast experience makes him a perfect addition to the Stallion 51 team.